Aviation Suppliers Association - Saitech Inc.
Saitech is a corporate member of the Aviation Suppliers Association. The ASA Member Logo is known throughout the industry as a symbol of a dedication to quality and safety. All ASA Members are entitled to use the ASA member logo on their Web sites, stationery and other printed materials. Please note, ONLY Aviation Supplier Association members that are also accredited in accordance with FAA AC-0056A are eligible for the exemption. Aviation Suppliers Association provides a unified voice for the aviation supplier industry. 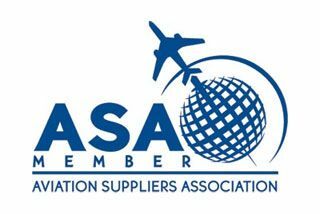 Speaking on behalf of suppliers in the U.S. and abroad, ASA works to clarify existing regulations and ensure that new regulations foster safety and improved business practices. Aviation Suppliers Association members receive discounted attendance to educational events. Quality, Business Development and Legal/Regulatory issues are all included in this comprehensive educational event designed for all aviation supplier professionals. These one-day training sessions bring aviation professionals up to date on all regulatory changes. This course provides the fundamentals of hazardous materials handling, marking, reporting and transporting. Aviation Suppliers Association offers several publications designed to keep members aware of regulatory and business news in the industry. Comprehensive coverage of the regulatory, business and quality issues happening in aviation distribution. Sent monthly, Member Bulletins provide industry updates and association news, exclusively to members. Sent exclusively to members on a periodic basis, these alerts offer immediate updates on industry news as it happens. ASA has partnered with Silver Eagle Agency to offer ASA Members exclusive discounts on aviation products liability insurance. To receive a quote, visit Silver Eagle’s ASA Member website. ASA and ChoicePoint have teamed up to offer ASA Members discounted employee background checks on LexisNexis ScreenNow. ASA Members receive 40% off regular prices! ExaGrid, Storage Backup contract awarded by Stanislaus County Superior Court to Saitech, Inc.
Saitech awarded $72K contract by US Senate for Veeam Management Pack Enterprise Plus for VMware! Saitech Inc. Back 2 Back annual Inc. 5000 winner! © Copyright 2018 Saitech Inc. All Rights Reserved.